I'm back on track and trying to get creative. The problem, a few years in, is you come up with some tried and true recipes and you want to stick. But I decided to try something new. 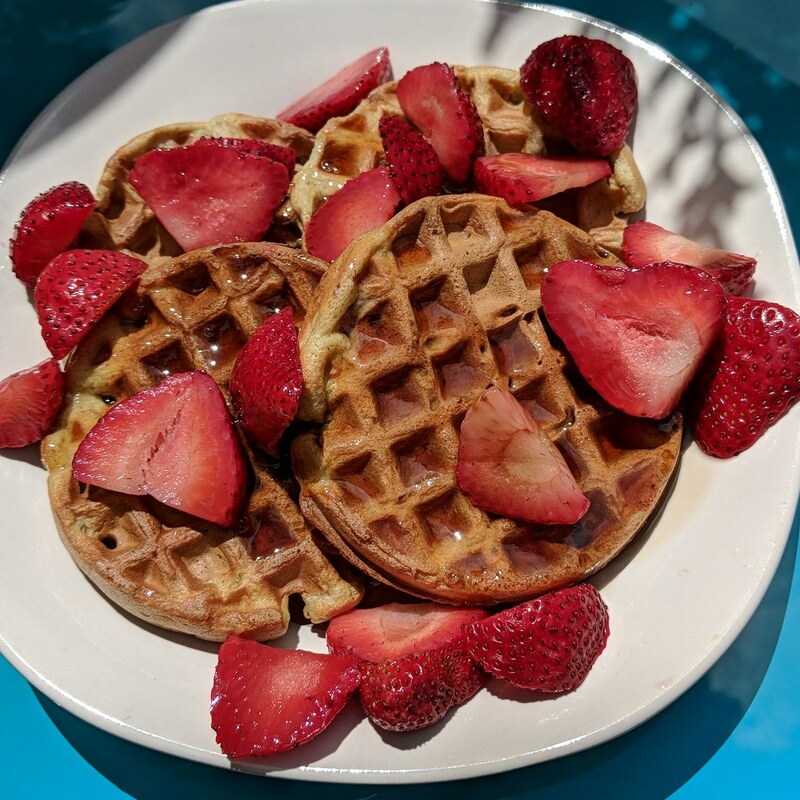 So, I looked at a recipe I have lying around for banana pancakes, and decided to make avocado waffles. I've got this last bit of strawberries left that has to be used up, so I decided to toss that it. They were delicious and fluffy. If you like a crunchier waffle, I recommend toasting before serving. I like to freeze them in packs of so many, and then I can pop them in the toaster on a work day. In medium bowl, combine avocado, egg, sweetener, salt, nutmeg, vanilla and coconut milk drink. Beat as smooth as you can. Heat up your waffle iron . Use a little less batter than you normally do. These also take much longer to cook. Don't remove until easily can open maker. Makes 12 mini waffles at 65 calories a waffle. Seen: 4 mini-waffles, 4 oz. of sliced strawberries, 2 Tbsp. Lakanto maple flavored syrup, 2 Tbsp. Market Pantry Lite syrup for 360 calories.